Going into Walburg, I had been told the race would suit me well, which was the reason I got excited to do the race on Saturday. I had been warned by some veterans that Walburg is always a windy, poor weather race. The weather turned out alright temperature-wise, though the wind picked up and made for some excitement. I woke up early Saturday morning to make sure I had time to pack everything I thought I might need into the car. With the way our weather had been, I packed some extra cold weather gear (which I was sure glad to have during my warmup). My teammate Chris and I got all of our gear and bikes loaded, and we headed out to Walburg. On our way to the race, we tried to keep each other relaxed by joking around and making fun of each other. 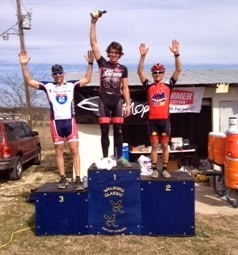 Walburg was Chris's first road race and my first one of the season. As we made the turn off the highway towards Walburg, we struck a deal that we would yell at each other if one of us was doing too much work at the front. We were worried that we would waste all of our energy at the front and get dropped. After getting registered, Chris and I warmed up. We were told by a Cat 2 that a few breaks would go off the front, but the pack would reel them back in before the finish and not to worry about any breaks. We decided that he was probably right and that if anything we would just take a couple of pulls at the front to help the chase pull anything back in. We did our last-minute checks and headed for the start line. Chris and I lined up at the back (we were a little late) with the 46 other Cat 5As. We lucked out, though; the race started out neutral, which gave us plenty of time to settle in and scope out a way to the front. Our race almost ended prematurely with a crash that happened right in front of us. The crash only involved one rider, and everyone else managed to escape unharmed, but it did make Chris and me give each other a bit of an uneasy laugh. The race finally started. I looked back at Chris to make sure he was following me as I began moving up through the field. There was a nice tailwind in the first part of the race that kept our speeds pretty high. I could see a couple of guys making moves off the front, but nothing seemed very serious. Once we made it up to the first 15 or so riders, I found a spot to just sit in and keep from putting my nose in the wind, while Chris kept slowly making his way forward. Somewhere around mile 7 or 8, a United Healthcare rider made a move and got away, and then a Jack & Adams rider chased after him. They started to work together and seemed to be making a decent gap on us. Chris moved up to the front and took a pull, but as he pulled off we slowed back down, and the break started to make more ground on us. At about 11 miles into the 28 mile race, I realized I couldn't let a Jack & Adams rider beat Austin Tri Cyclist, so I moved up through the other riders thinking I would jump on the front and help reel those guys back in before they got away too far. I got on the front of the group to take a pull, but everyone around me slowed down. I was feeling really good and wanted to test my legs, so I made a move to bridge the gap. As I started making my move, I knew I had promised my teammate that I wouldn't work too hard, but I just felt too good to worry about that. I bridged the gap quickly, but it had taken a lot out of me, and I started to think about how the move I had just made was stupid and I had just wasted a bunch of energy. The other two riders in the break started to form up, and we began our pace line. I was recovering quickly, but I knew I would need to conserve my energy in case we got picked back up by the pack. We made the right-hand turn into the wind, and we quickly found a rhythm in our pace line and kept trucking along in front of the group. As we drove along, the only thing that was going through my head was what our Cat 2 friend told us before the race: don't worry about any breaks because they won’t last. Then around 15 miles in, we had another rider join our break, making four of us. He got our pace back up and got all of us to start working harder. We kept up this pace for a while and seemed to be making really good time, but it didn't last. We made a turn and started up a climb. The hill seemed to be deceptively steep and difficult. When we hit the climb, Mr. J&A kept up the pace, and I jumped on his wheel when I noticed the other two riders start to fall back. After cresting the climb, I pulled through and glanced back. Our other comrades had fallen off pretty hard and seemed like they were sitting up to wait for the chase group. So Mr. J&A and I regrouped and started to push the pace. I looked down at my computer and saw that we still had about 10 miles left to go. I was worried that we would get picked up before we made it to the finish, so I tried my best to conserve my energy for the field sprint I was convinced was going to happen. I thought my chances for winning the sprint were good even if it was a large field sprint, but I didn't know for sure after spending so much time in the break. We kept our pace high, and Mr. J&A pulled me up the hills, and I took us down the rollers. We kept this rhythm for another 7 miles before I looked down and noticed we only had 3 miles to go. I risked taking a look behind us to see if we would make it, and I saw the chase group was starting to breathe down on us, but ahead was a twisty section that would play to our advantage. I took the lead and railed through the corners, and we started to open our gap back up. We kept that pace all the way through to the last right-hand corner, which revealed a couple of flags on a short hill in front of us. Mr. J&A and I slowed our pace to a crawl, to see what the other would do. We asked each other if this was the finish as we climbed up the little kicker. Once at the top we saw the 200-meter marker and the finish line. We had already started our cat and mouse games and had no plans to stop playing. I was able to fall back behind him and let him lead me out to the 200-meter marker and made my jump and sprinted for the line. I was too wrapped up in the moment to know whether he got onto my wheel so I pushed harder and lunged for the line, taking first. Afterwards I was slightly confused, then overjoyed when I realized I had won first place, and I threw up an arm in excitement. Saturday at Walburg was my first race win and has me excited for this coming weekend at Lago Vista to try and go for it again. Even Chris admitted to having fun and is excited to try again this weekend. Even though I don't think Lago Vista will be as windy as Walburg, Sunday does have that hard climb and that should make for an interesting race. The P2 is dead. Long live the P2! 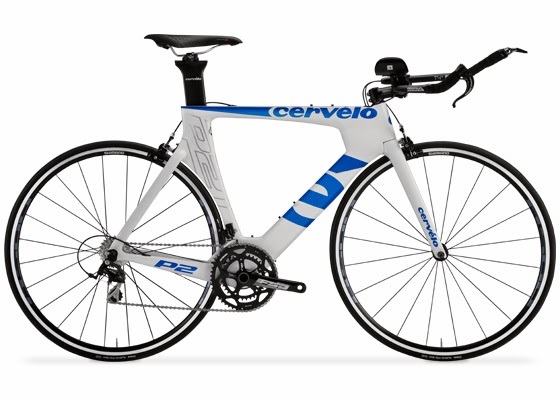 Since 2006 the Cervelo P2 has enjoyed an incredible run of success. For eight years little was changed about it aside from new forks. It was famously ridden to two Ironman World Championships by Chrissie Wellington. Countless amateurs have racked up wins on it, such as our recently profiled Texas State Cat 3 Champion. The price point and simplicity of the bike make it popular to this day, despite its age. 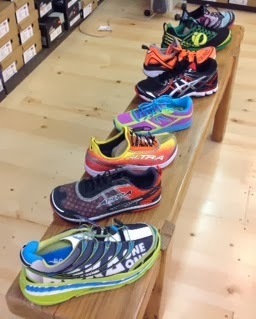 But the time has come for a new P2, and it is in stock and ready to rock. That's it. The frame is identical to the P3. 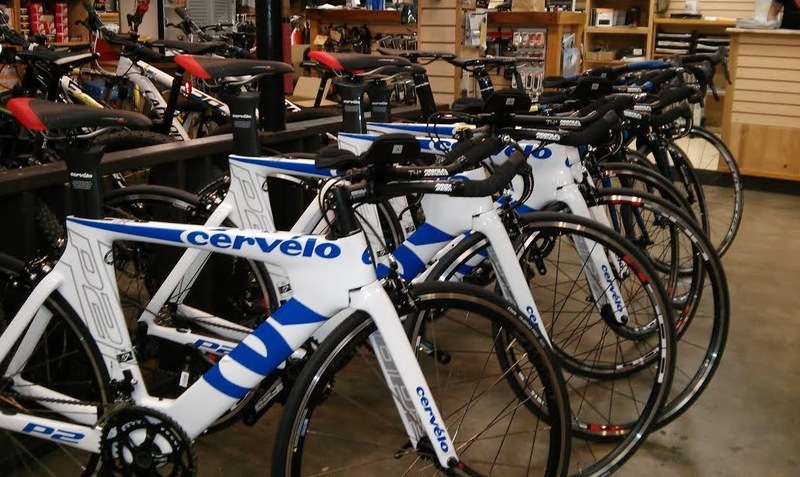 Cervelo is shaving cost only by using less expensive components and a slightly thicker fork that is cheaper to manufacture. This has interesting implications for people who tend to upgrade their bikes – the new P2 should only be an Aero Tune-up away from being about as fast as a P5! Or, just leave it alone knowing that the bike is already as fast as others costing twice as much. The new P2 sticks with the tried and true formula of its predecessor. It is affordable, simple, and aerodynamic. There are no hidden brakes or integrated front ends to give you a headache. Just a very fast, zero hassle bike. Extreme aero weenies have noted that the rear brake cable inserts into the side of the top tube, exposing the cable to a bit of wind. If you don't like the aesthetic or can't stand the thought of a even a second wasted, cable housing can be routed through the top tube instead. Just ask your friendly ATC mechanics and they will set it up that way!